Chowdhury Mueen Uddin has been in public service and was involved with grassroots community organisations for over three decades. Until recently, Chowdhury Mueen Uddin was Director of Muslim Spiritual Care Provision in the NHS, advising healthcare providers on how best to provide patients spiritual care at times of need. As part of this work, he was elected chair of the Multi-Faith Group for Healthcare Chaplaincy, a national organisation of nine world faith groups including Anglican (Church of England), Roman Catholic, Free Churches, Muslim, Jewish, Hindu, Buddhist, Sikh and Jain. 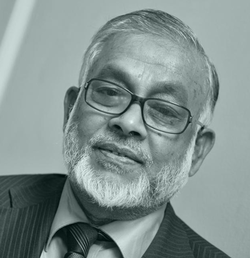 Chowdhury Mueen Uddin has served on the Board of a number of distinguished charities. These include, among others, Board member Labo Housing Association and Gateway Housing Association; Past board member and vice chairman – As-Shahada Housing Association; Chairman and board member – Muslim Aid; Vice Chairman – East London Mosque and London Muslim Centre). He served as the Secretary General of the Council of Mosques UK and Eire for 2 terms (1984 – 1988) and was involved – along with many others – in setting up the Muslim Council of Britain (MCB). He was formerly Deputy Director of the Islamic Foundation, Markfield, Leicestershire (1995 – 2005) and, prior to that, worked for a leading Housing Association in London. Chowdhury Mueen Uddin is married and lives in London. He was born in Bangladesh and read Literature at the University of Dhaka. He began his career as a journalist, filing moving accounts of the Great 1970 Cyclone and interviewing the burgeoning independence leader of that country, Sheikh Mujibur Rahman. Today he occasionally contributes to newspapers and journals and some of his articles were published in journals in housing related sector such as ‘Regeneration' and ‘Planning'.